Net Deployment VIMS professor Deborah Steinberg helps deploy a plankton net in the waters of the Amazon Plume. Photo by Jason Landrum. York River Field Trip Professor Deb Steinberg (C) shows a jar of zooplankton to summer interns during their field trip on the York River. MOCNESS Plankton Net Steinberg's team uses a MOCNESS plankton net (for Multiple Opening and Closing Net Environmental Sensing System) to collect zooplankton from discrete depths. Zoop Crew Scientists with the VERTIGO project studied plankton from the North Pacific Ocean's twilight zone. From L: Toru Kobari (Kagoshima University, Japan), VIMS marine technician Joe Cope, VIMS graduate student Stephanie Wilson, and VIMS Professor Deborah Steinberg. 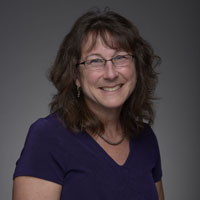 Professor Deborah Steinberg of William & Mary’s Virginia Institute of Marine Science has been selected as one of the Commonwealth’s outstanding faculty members by the State Council of Higher Education for Virginia (SCHEV). Steinberg, the CSX Professor of Marine Science in W&M’s School of Marine Science at VIMS, was one of 13 faculty members from Virginia’s public and private colleges and universities honored with a 2015 SCHEV Outstanding Faculty Award. The awards program has been sponsored by Dominion Resources since 2005. VIMS Dean and Director John Wells adds, “Debbie is a gifted and remarkably dedicated teacher and mentor who is highly deserving of this award.” Steinberg consistently receives outstanding evaluations in her graduate and undergraduate courses, and since arriving at VIMS in 2001 has served as major advisor to 6 Master’s students, 7 Ph.D. students, and 2 postdoctoral fellows. She has also served on the thesis committees of 28 additional graduate students, 24 at VIMS and 4 at other institutions, and has mentored 14 undergraduate and high-school students. 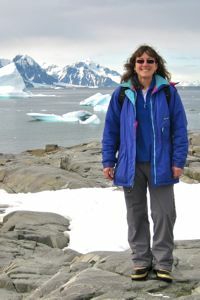 Outside the classroom, Steinberg has established an international reputation in biological oceanography. Her research focuses on the role that zooplankton play in marine food webs and the global carbon cycle, and how populations of these small drifting animals are affected by changes in climate. Steinberg’s research programs have operated in marine ecosystems from Chesapeake Bay to Antarctica, the Sargasso Sea, the Amazon Plume, the California Current, and the North Pacific. She and a team of students and staff will return to Antarctica in late December for another 6-week field season, marking 7 years of involvement in the National Science Foundation’s Long-Term Ecological Research program at Palmer Station on the West Antarctic Peninsula. 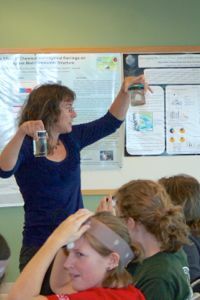 In her 2013 Tack Faculty Lecture, Steinberg engaged 400 members of the local community in a discussion of plankton and deep-sea ecology, emphasizing the relevance of these fields to fisheries management and climate-change projections. Steinberg and her research group also participate in a wide variety of outreach programs at VIMS, including the Institute’s annual Marine Science Day open house, weekly public tours, and “Science Under Sail” cruises with Yorktown Sailing Charters. Steinberg is widely recognized for her service to Virginia, the nation, and the international community. She has advised the Commonwealth through her work with the Chesapeake Bay Program Scientific and Technical Advisory Committee, serves on the governing council of The Oceanography Society, is a member of the Board of Trustees of the Bermuda Institute of Ocean Sciences, and was recently named as chair-elect of the University-National Laboratory System, which helps the federal government coordinate the nation’s oceanographic research fleet. To date, Steinberg has authored or co-authored 83 articles in peer-reviewed journals, including 2 papers in Science, America’s leading scientific journal. She has earned more than $6 million in competitive research grants from the National Science Foundation and NOAA since 1997, and during her 25-year research career has spent a cumulative 1.5 years at sea on more than 50 research cruises. She is the recipient of the American Geophysical Union’s prestigious Sverdrup Award lecture, in 2012; a Plumeri Award for Faculty Excellence from W&M in 2014; and the Dean’s Prize for Advancement of Women in Marine Science from VIMS in 2006. Steinberg joins six other VIMS faculty in winning the SCHEV award. Including this year's awardees, 38 W&M professors have received the honor since the awards' inception in 1987, more than any other university in the Commonwealth. This year marks the 29th anniversary of the statewide program. The 13 recipients were selected from a pool of 88 applications based on accomplishments that strongly reflect the missions of their respective institutions. The recipients will be recognized during a Feb. 19 ceremony in Richmond, where each will receive an engraved award and a $5,000 check underwritten by the Dominion Foundation, the philanthropic arm of Dominion Resources. Dominion Resources is the parent company of Dominion Virginia Power. The OFA program is administered by SCHEV and funded by a grant from the Dominion Foundation. Since the first awards ceremony in 1987, 341 Virginia faculty members—including the 2015 recipients—have received this high honor. SCHEV is the Commonwealth’s coordinating body for Virginia’s system of higher education. The agency provides policy guidance and budget recommendations to the Governor and General Assembly, and is a resource for information on higher education issues for Virginia colleges and universities. Dominion is one of the nation's largest producers and transporters of energy, with a portfolio of approximately 28,000 megawatts of generation. Dominion operates the nation's largest natural gas storage system and serves retail energy customers in 15 states.